Our thanks to Mr Mark Hamid of the Confraternity of St Ninian for sharing with us this account of the annual Two Shrines Pilgrimage which recently took place in Scotland. 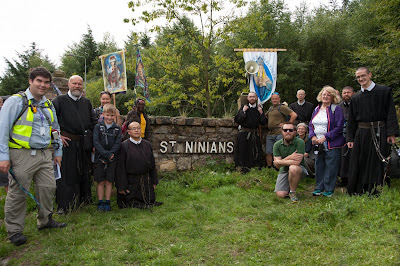 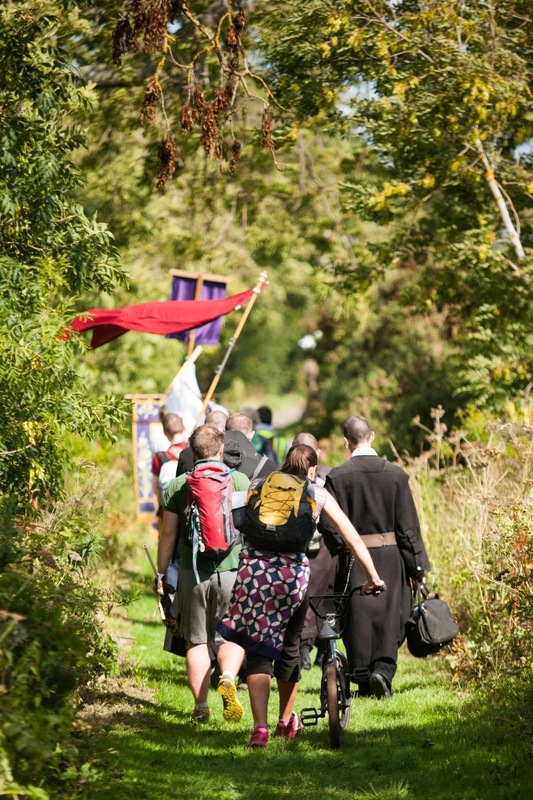 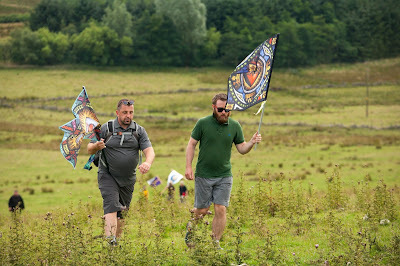 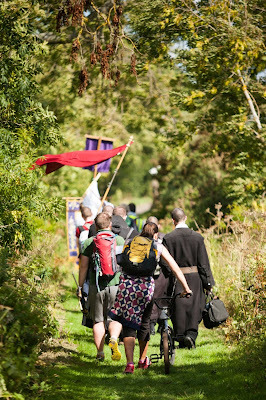 From Saturday, August 4th, to Monday the 6th, The Confraternity of St Ninian made its third annual Two Shrines Pilgrimage, a three-day walk inspired by the Chartres pilgrimage in France, in honour of Scotland’s patron saint, the Apostle Andrew. 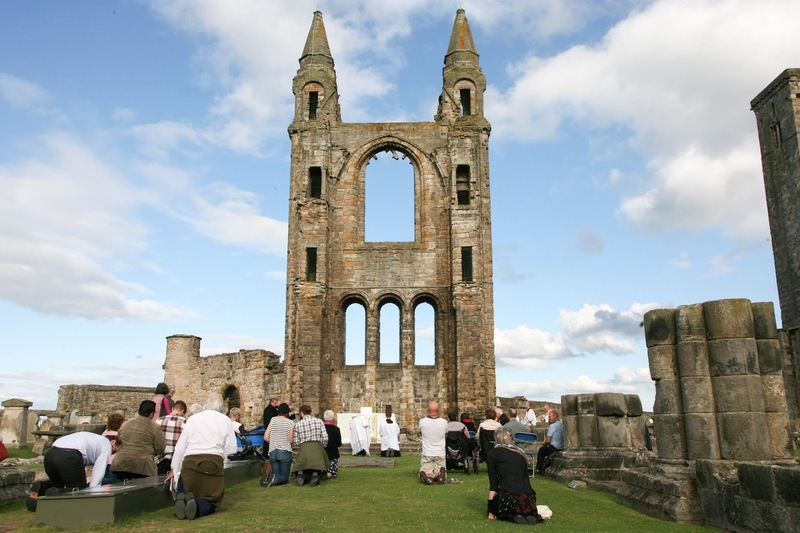 Pilgrims walked from his national shrine in Edinburgh to his former medieval shrine in the ruins of the cathedral in St Andrews, a distance in excess of sixty miles. 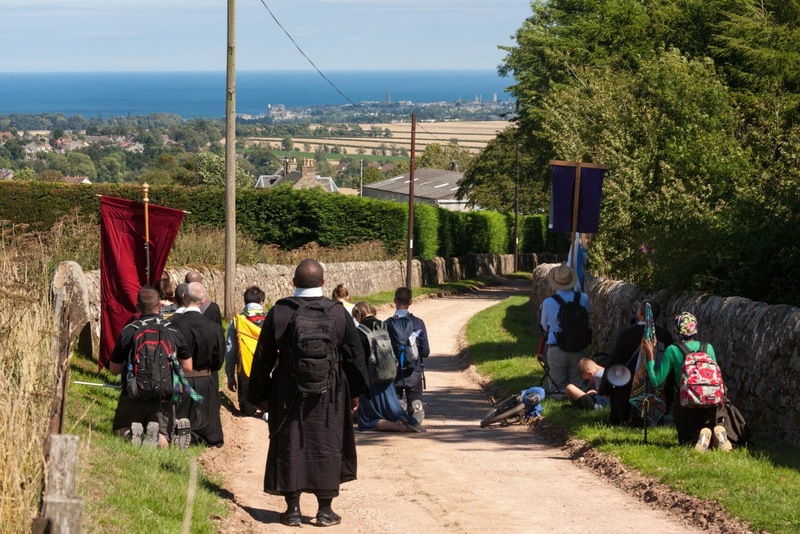 The pilgrimage was made for the particular intention of the reconversion of Scotland to the Faith, and in the spirit of countless medieval pilgrims from across Christendom who had made St Andrews one of the foremost sites of ancient pilgrimage. Over the course of the journey, the pilgrims received spiritual support from a group of eight members of the Sons of the Most Holy Redeemer, led by Fr Anthony Mary FSSR, with the programme incorporating daily sung Mass, sung rosary, and other traditional devotions and hymns. 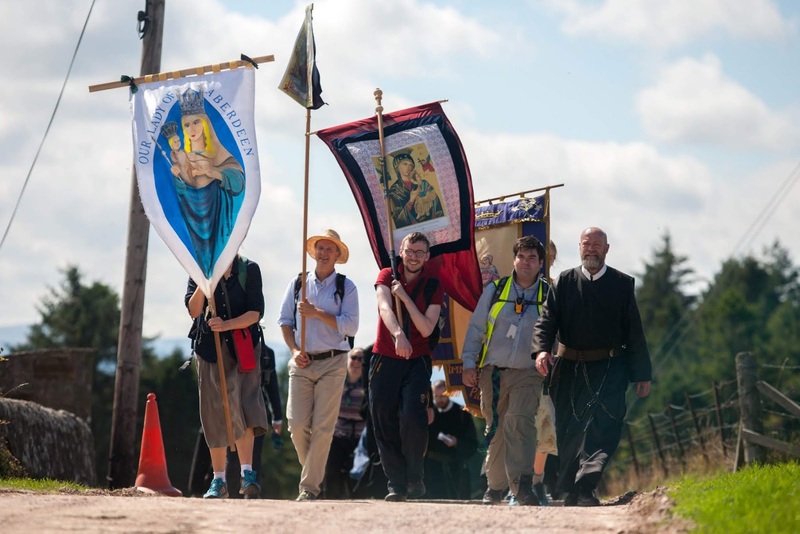 Brothers from the community gave a variety of talks on theology and the sacramental life, and the pilgrims also enjoyed fellowship, both on the way and each evening with the opportunity to share dinner and socialise with one another. 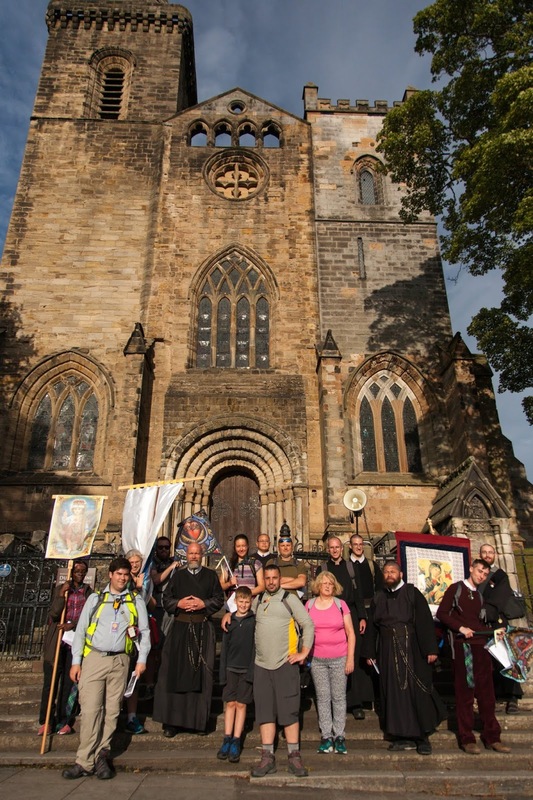 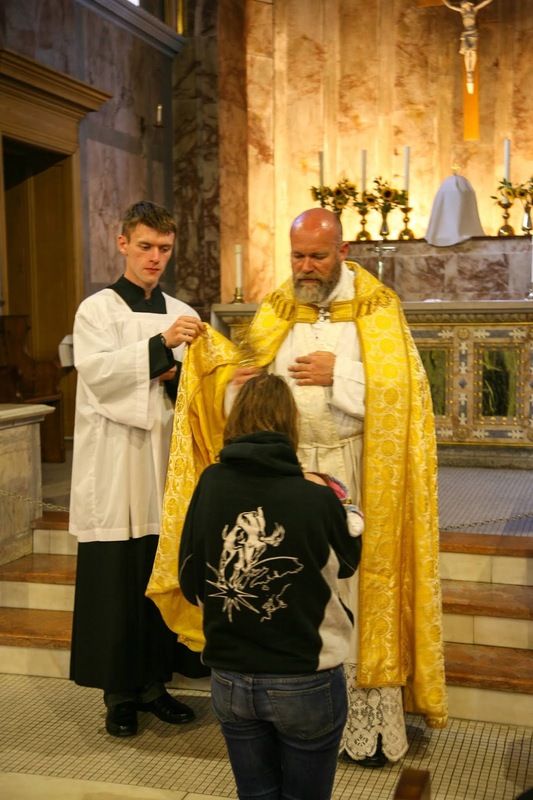 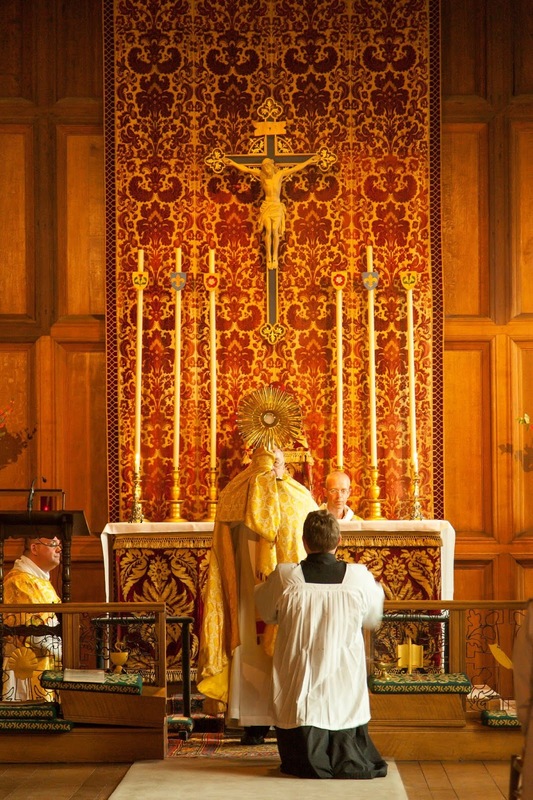 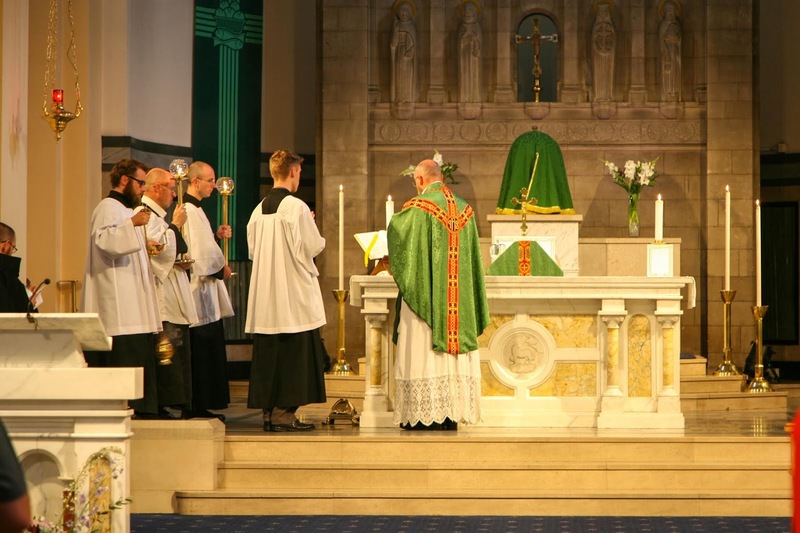 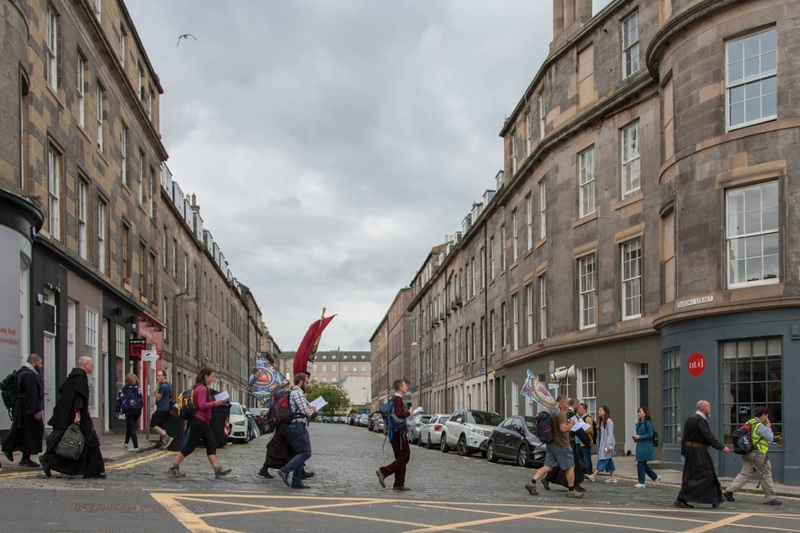 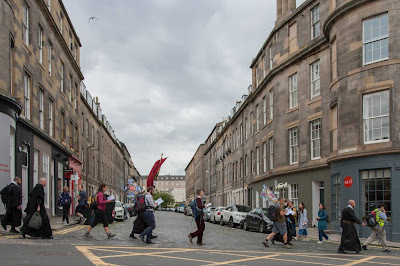 The pilgrimage began on Saturday morning at St Mary’s Metropolitan Cathedral in Edinburgh before setting out on the short walk to Holy Cross Church, Trinity, where Fr Anthony Mary offered Holy Mass for the pilgrims’ intentions, a Votive Mass for Pilgrims and Travellers. 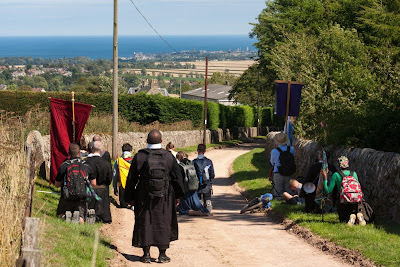 The pilgrims drew much attention (both positive and negative) from passers-by, on account of their many sacred banners and the distinctive riband worn by Confraternity members, which is made from the St Ninian tartan devised for the visit of His Holiness Pope Benedict to Scotland on their patron’s feast day in 2010. 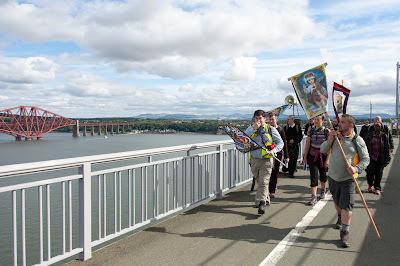 Leaving Edinburgh by the ancient Cramond Brig, the pilgrims proceeded towards the Firth of Forth where they crossed into Fife at the site of the (now three) iconic bridges which replace a ferry endowed in the eleventh century by St Margaret, Queen of Scots, to assist pilgrims in former times. Arriving in Dunfermline, St Margaret’s royal capital, they visited the abbey there and the site of her pre-Reformation shrine, before arriving at the magnificent late nineteenth-century church built in the town to house those of her relics which have survived to the present day. 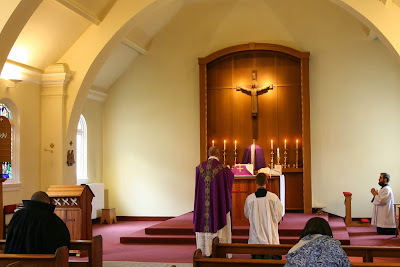 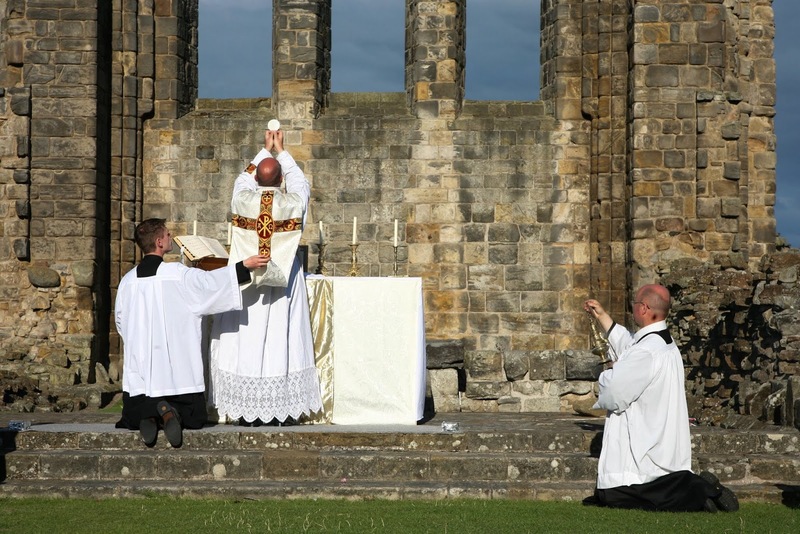 On the second day pilgrims heard Holy Mass, offered for the intentions of benefactors and supporters, at St Margaret’s Church before setting out across southern Fife. 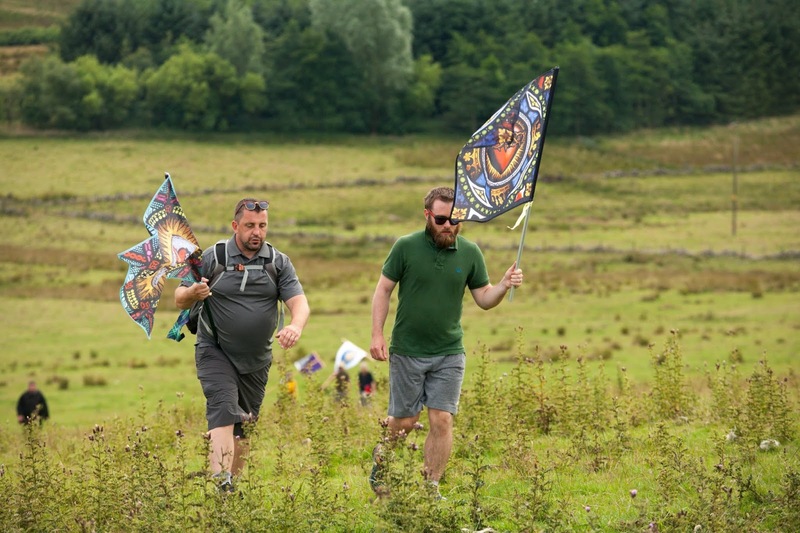 In the morning they took in the almost apocalyptic post-industrial landscape of the defunct Fife coalfields (including the site of an opencast mine named after St Ninian) before taking in the natural beauty found in the heights of the Lomond Hills Regional Park. Descending to the former royal hunting lodge at Falkland, Bishop Steven Robson of neighbouring Dunkeld Diocese once again lent his support to the pilgrims’ efforts by presiding at a Holy Hour at the Chapel Royal, Falkland Palace, which concluded with Pontifical Benediction of the Blessed Sacrament. The third and final day was again one with notably clement weather, the whole pilgrimage being walked in conditions which were neither too wet or too sunny to add to the pilgrims’ discomfort. 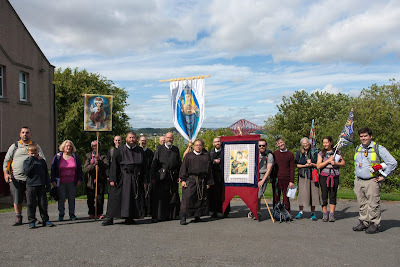 Following a morning of walking through the fertile farmland of the Eden valley, the pilgrims ascended the final climb of the pilgrimage to catch their first sight of the cathedral towers in St Andrews about four miles from the town. Following the custom at Chartres, pilgrims fell to their knees and sang the Salve Regina in thanksgiving for their Blessed Mother’s protection, together with a hymn in honour of St Andrew. 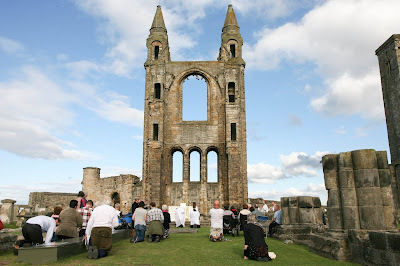 The climax of the pilgrimage was a Sung Mass in the ruins of St Andrew’s Cathedral, St Andrews, on the site of the former High Altar and metres from the believed site of the Apostle’s mediaeval shrine. 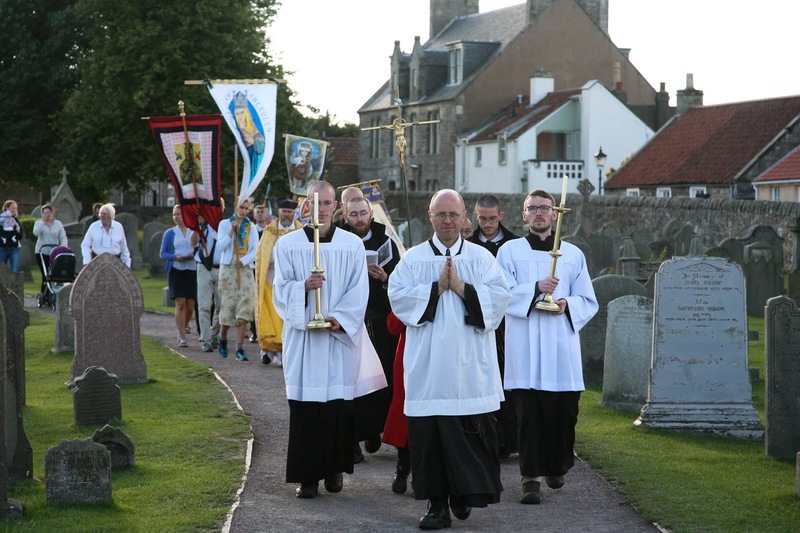 The Mass, offered for the intention of the reconversion of Scotland, was followed by a procession with a first-class relic of the saint through the town to its parish church (itself dedicated to St James, patron of pilgrims and friend and fellow apostle of St Andrew) where pilgrims were able to receive individual blessings with the relic.